Of Dreams I dreamed last night of having received a new kind of laptop. One that looks like a harmonium (see photo)! The front panel (the one which is pushed to play the harmonium) extends upwards to double as a screen for the laptop! 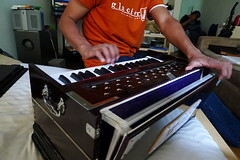 The USP of the entire thing was that the laptop could play melodies using the built-in harmonium – all you had to do was to program the melody. Of Clouds On one of the shows that I watched, I had the host asking how long it would be before an average Fortune 500 or 1000 company would be using the Cloud computing. My guess is 5 years, no sooner. Yes, it provides cost savings but its not easy for companies to get rid of old hardware.